Amazon expands into the smart home once again. The home-security-camera market is a saturated one, with contenders from the likes of Logitech, Netgear and, perhaps trendiest of all, Nest. Now there's another, rather surprising, company joining that fray: Amazon. Like the others, Amazon's "Cloud Cam" keeps tabs on your home while you're away, but it also works with Alexa. It's a decent camera overall, and at $120 (cheaper per unit if you buy multipacks) it's affordable. But Cloud Cam's integration into Amazon's ecosystem is likely its main selling point. 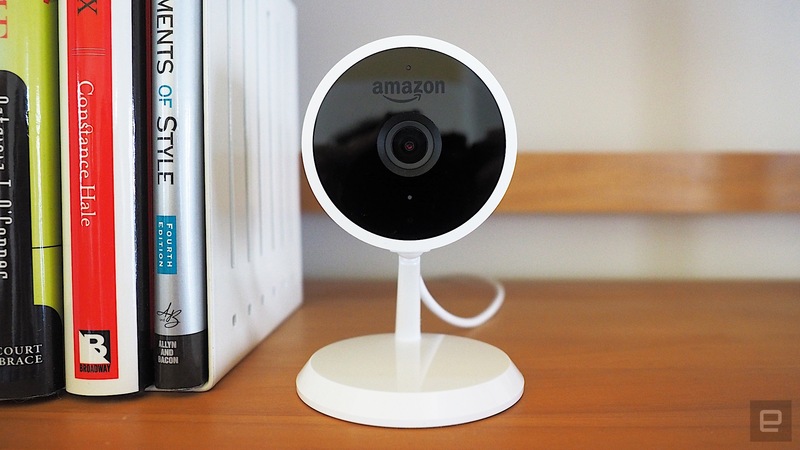 Amazon's first home security camera offers great value for the money. Not only is it cheaper than comparable rivals by $80 or more, it stores recorded events for up to 24 hours without requiring a subscription. 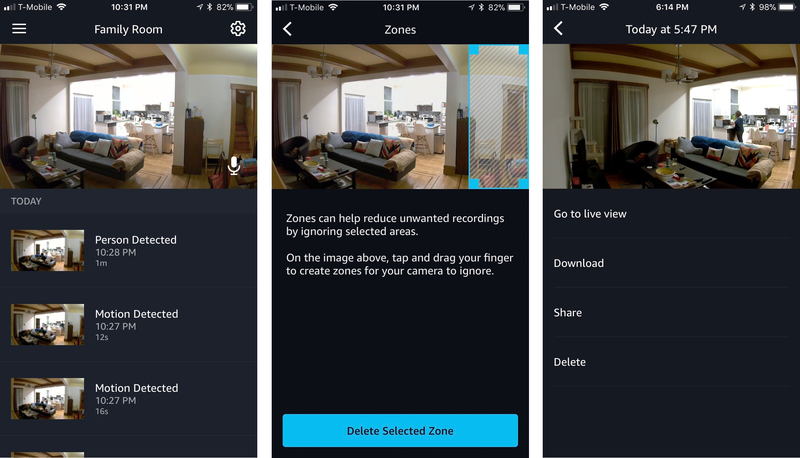 Subscriptions buy you more storage space and you also get the benefit of extra features like person detection and setting up zones for the camera to ignore (which we wish were available by default). The Cloud Cam's geofencing feature does get a little temperamental but its other qualities more than make up for it. Be the first to review the Cloud Cam? 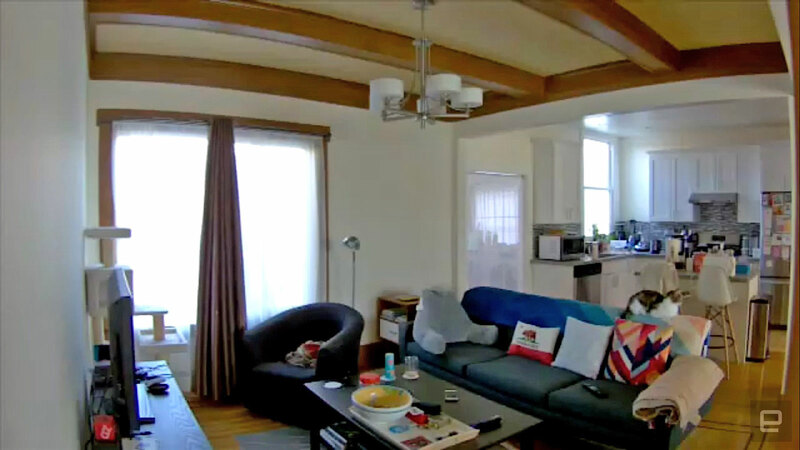 Compared to the Nest Cam, the Cloud Cam is pretty lightweight. Thanks to its all-plastic build, it weighs only 5 ounces (compared to the Nest's 7.5). But lightweight doesn't mean flimsy. On the contrary, the Cloud Cam is equipped with a 70 mm-wide sturdy base with rubberized footing. The camera is mounted on a flexible ball pivot that rotates 360 degrees. Unlike the Nest, however, the Cloud Cam's base is not magnetic, and you can't remove it, either. The Cloud Cam does ship with an optional wall mount, however. 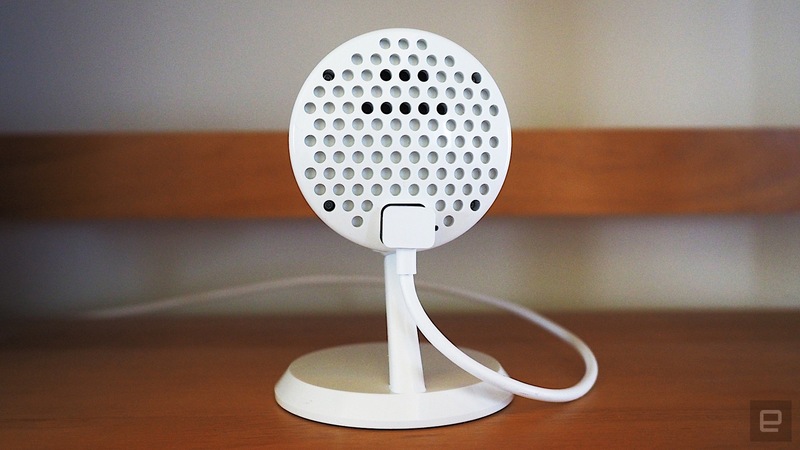 Setup is simple: Plug the Cloud Cam into the wall, download the app and follow the pairing instructions. The LED above the camera flashes blue on startup and blue/green in pairing mode. In my experience, the app discovered the camera pretty quickly. From there, I entered my WiFi and Amazon credentials -- for access to videos and linking with other Amazon services -- and it was up and working. I also had to name my camera, which comes in handy when used with Alexa (which we'll get to later). Oh, and that LED light? It's permanently green when the camera is on; there's no way to turn it off. Amazon says this is so users know exactly when you're on camera and when you're not. This is understandable, but also means you can't have the camera on in stealth mode. 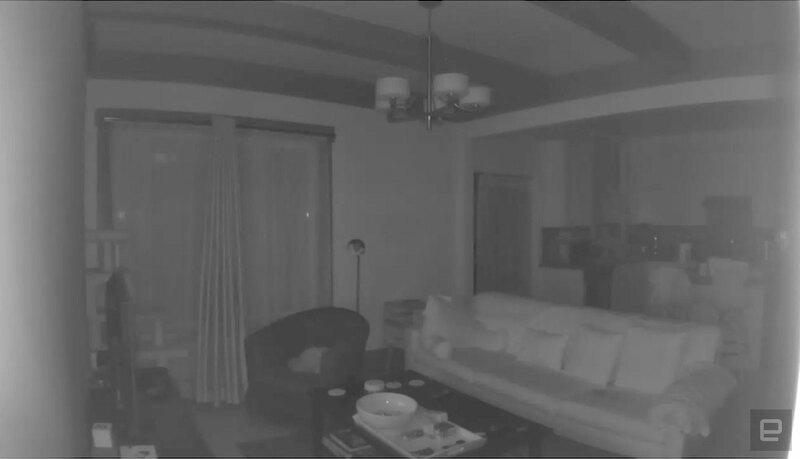 The Nest Cam, for example, lets you disable the status LED for this purpose. I was immediately impressed with the image quality from the Cloud Cam. It has 1080p resolution and a wide 120-degree field of view. My apartment is small, so this was more than enough to capture both my living room and my kitchen. The camera also has night vision, which activates automatically when dark (the Cloud Cam has an ambient light sensor). Night-vision recordings looked bright and crisp, which is valuable when browsing clips to see exactly what triggered the motion-detection. That motion sensor also happens to be one of the main features of the Cloud Cam. Essentially, whenever the camera detects motion, it'll start recording a video and send you a push notification. You can adjust the sensitivity, from high to low (high detects a person-size object up to 20 feet away, medium at 10 feet away and low up to 5 feet away). You can set notifications to arrive every time an event occurs, or at certain intervals (every few minutes, hourly, daily or never at all). Unfortunately, you can only receive notifications via the app, and not via email or text. By default, the Cloud Cam stores up to 24 hours of recorded clips, with support for up to three cameras. If you want more storage you'll need a subscription. Basic ($7 a month or $69 a year) increases the limit to the last seven days for up to three cameras; Extended ($10 a month or $99 a year) stores 14 days of video for up to five cameras and Pro ($20 a month or $199 a year) offers a full month of clips for up to ten cameras. One of the ways to access those clips is via the aforementioned app. You can download them to your phone, share them via Airdrop or social media or simply delete them altogether. The clips are also stored automatically in your Amazon Drive account, which you can access via a browser. A subscription will unlock two other features: Person-detection and Zones. Person-detection fine-tunes the Cloud Cam's motion-sensitivity to detect when a person is in the room versus a pet (or Roomba, etc.). There are options to receive notifications of person-detection but not motion-detection, or vice versa, or both. Zones, on the other hand, blocks out certain areas of the room from being detected. So, for example, you can draw a square around the TV or a ceiling fan in the app, and the camera will ignore any motion in those areas. In my experience, the motion sensors worked really well. It let me know when our cat was on the couch (which is fine) or when she was on the kitchen counter (which is not as fine). Since I also had the Pro subscription, it also let me know someone was in my apartment when my husband walked in. I also tried out Zones with a corner of the room, and sure enough, no matter how much I waved around in that corner, I couldn't trigger the motion sensor. The Cloud Cam also has geofencing that deactivates the camera when you're home or switches it on when you leave. To enable this, select the "Home/Away" toggle in settings and specify your camera's location. Now, whenever you leave the house (with your phone, of course), the camera will turn on automatically. And when you arrive home, the app will let your camera know you're in close proximity and it'll shut off. What's nice is that the feature works with multiple phones: If more than one person has the Home/Away feature enabled, all parties need to leave the house for the camera to turn on. If one person arrives home early, then the camera turns back off -- it doesn't need everyone to be home. While that sounds useful, I had trouble getting it to work reliably. Sometimes when I was home, it wouldn't turn off; sometimes when I was out, the camera wouldn't turn on. When I asked Amazon about this, a spokesperson said to try relaunching the app. I did, which made the camera work as intended, but I ended up having to do this pretty often. It was so annoying that I just decided to turn the camera on and off manually. Perhaps the main reason you'll want the Amazon Cloud Cam above all other security cameras is that it works with Alexa. Amazon loaned me a Fire TV Stick to use with Cloud Cam, but the company tells me that it will also work with the Echo Show, Echo Spot, any Fire TV product and any Alexa-enabled Fire tablet. Remember when I signed in with my Amazon credentials during the Cloud Cam's setup? I was also asked to do the same during the setup of the Fire TV Stick -- so that all the Alexa devices could communicate with each other. 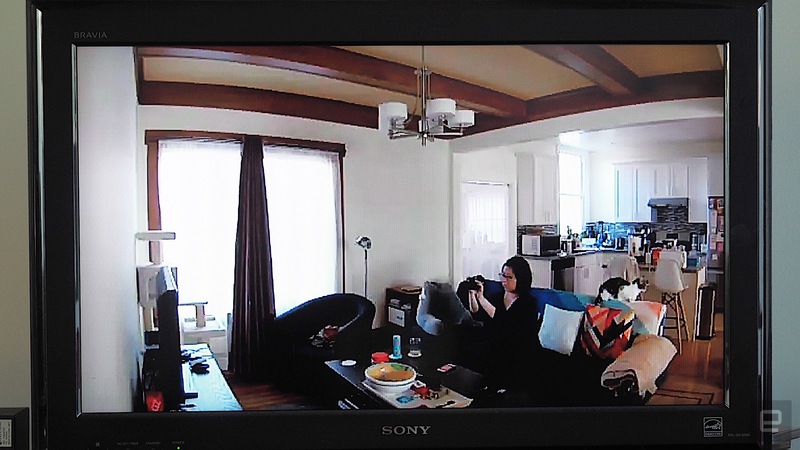 To test it, I held down the voice button on the Fire TV remote and said: "Alexa, show me the 'Family Room'" (which is what I named my camera) and voilà, live video from the Cloud Cam popped up on my television. I could even use the remote to talk to whoever's in the room with the Cloud Cam, as it has a microphone for two-way communication. Obviously, this is useful only if you're already invested in the Amazon ecosystem, but if you are, I can see how this would be helpful for keeping an eye on your kids when you're somewhere else in the house. I should mention here that Amazon plans on selling a different camera called the Key Edition Cloud Cam, which costs $140. This works in concert with a special Amazon Key-compatible smart lock, which is to be used with the Key service (that lets delivery people in the door when you're not home). The Key app lets authorized people in the door, and the Key Edition Cloud Cam will help confirm deliveries or identify friends and family. 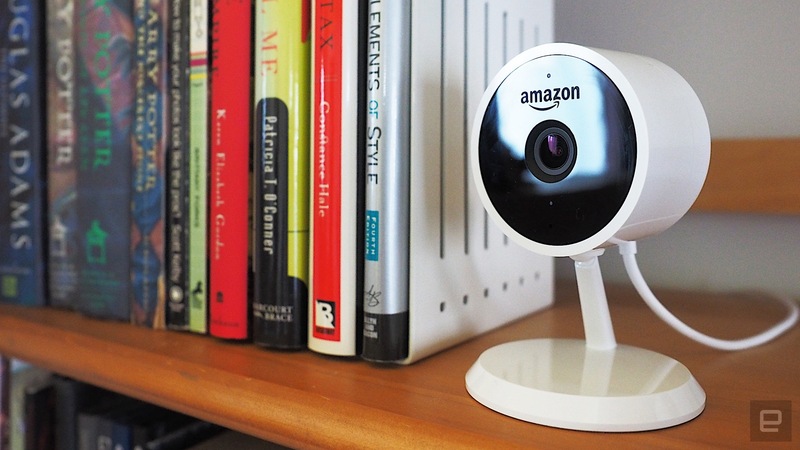 Amazon's Cloud Cam is surprisingly affordable for what it offers. It costs $120 for a single unit, but that drops to $100 (or less) if you get a multipack -- a two-pack is $200 while a three-pack is $290. 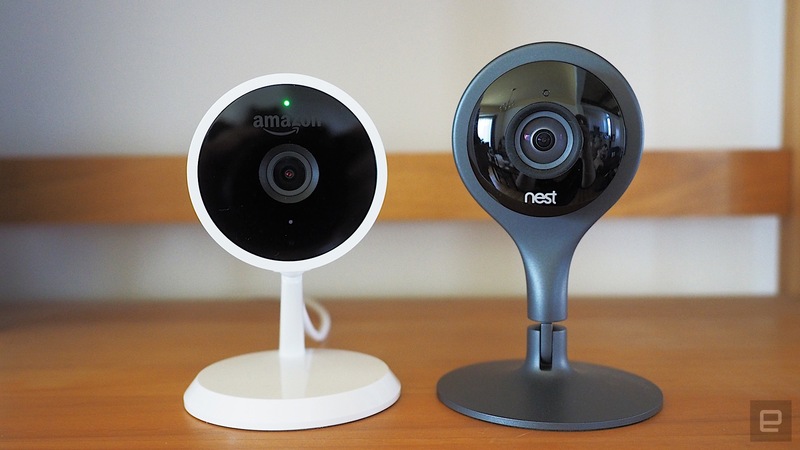 Other brand-name cameras with similar features are more expensive; the Nest Cam is $200, Logitech's Circle 2 is also $200 and Netgear's Arlo is $200 as well. The Blink home security camera is $100, but it doesn't have two-way audio nor geofencing, and it only has 720p video. Both the Circle 2 and the Cloud Cam offer 24 hours of video as part of the default package, which is great. That's a lot better than the Nest Cam, which doesn't offer any kind of archives at all unless you pay for a Nest Aware subscription. That said, the Cloud Cam doesn't have facial recognition. For that, you have to either cough up $300 for the Nest Cam IQ or $200 for the Netatmo Welcome. Another downside is that the Cloud Cam needs to be connected to AC power. Logitech's Circle 2 and the Blink camera both run on batteries, so they have way more placement options. Overall, Amazon's Cloud Cam is a pretty decent choice. It's well-built, affordable and has an advanced motion sensor that can separate people from pets (if you cough up the subscription money). The 1080p video quality is great, the default 24-hour archive is a nice bonus and the night-vision mode isn't bad, either. The geofencing feature is a little finicky, and you can't turn off the camera LED if you want it to be in stealth mode, but I didn't find those to be deal breakers. If you already have an Amazon device with a screen, like an Echo Show, the Cloud Cam is especially useful thanks to its integration with Alexa. On the whole, I found the Amazon Cloud Cam to be a surprisingly good value for a home security camera, with or without its Alexa tricks.